These laid-back, family-friendly fundraisers feature Middle Tennessee’s finest bluegrass music under the light of a full moon. Musicians and music lovers alike are invited to enjoy this beloved Nashville tradition in one of its most beautiful settings: Warner Parks. 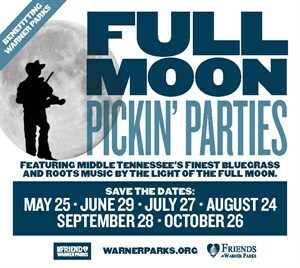 Join Team Lightning at Warner Parks for the Full Moon Pickin' Party! Come find us at the Lighting 100 flag near the gate for a 20% discount. For just $20 CASH ONLY, the first 30 listeners get admission and a wristband good for up to four beers! If you want to play in one of the pickin' circles, you can get even more discounts for showing up with your acoustic instrument. These laid-back, family-friendly fundraisers feature Middle Tennessee’s finest bluegrass music under the light of a full moon. Musicians and music lovers alike are invited to enjoy this beloved Nashville tradition in one of its most beautiful settings: Warner Parks. Bluegrass and roots pickers jam in circles under the trees and around the grounds, while three headlining acts perform on the main stage. All funds raised by the Pickin’ Parties go directly toward protecting the Warner Parks as well as funding educational programs and special projects that benefit park-goers of all ages! Pets: Dogs on leashes are allowed. Weather: Rain or shine! Event will be cancelled if there is severe inclement weather.